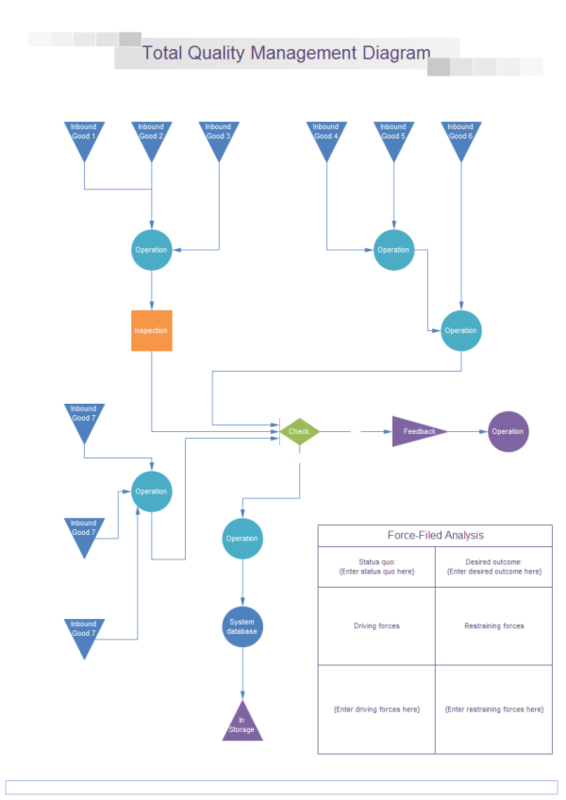 A simple TQM diagram drawing guide with TQM knowledge and basic drawing steps. Provide an easy approach for developing professional-quality TQM diagrams. TQM, shorted for total quality management, is an art of management for continuously improving the product and service in order to achieve customer satisfaction. It involves management, culture, attitudes, and workforce to meet or exceed customer expectations. 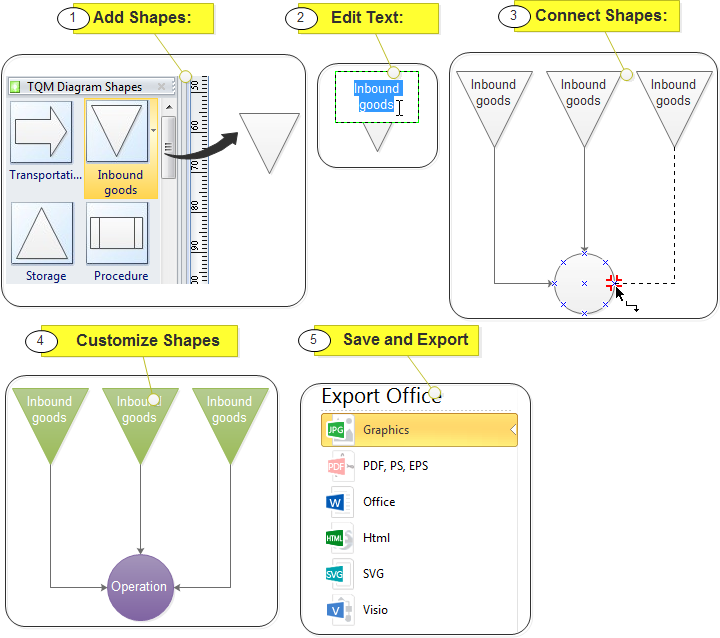 Start Edraw, from Available Templates, choose Business Diagram. The templates window on the right will appear dozens of business diagram drawing templates. Choose TQM template and double click to open. When a drawing page is open, the corresponding TQM symbol library will also open automatically on the left of the canvas. Drag a symbol you need and drop onto the canvas. You are able to change the shape size by dragging the selection handles without losing clarity. Double click a shape to add annotation. You can change font size and color under Home tab. You can either use connectors from the library or from the Home tab, Connector button. Edraw is designed with Snap & Glue feature, which means when the connector is connected with a glue point on the shape, they are "glued" together; and will not separate when you move the shapes. Under Home tab, there is a quick style gallery with various quick styles available. If you don't like them, you can find more filling colors through Fill button. From the Page Layout menu, you are able to one click change the diagram theme and with real-time preview. After it's done, you can right click on your mouse and choose "fit to drawing" to make the page size perfectly fit your drawing. As others may not have Edraw, you might need to export the document to other formats so that they can open and view. Click File tab, and go to Export & Send. There are many formats available including PDF, Word, Html, Visio, PPT, BMP, EMF, PNG, JPG and much more. 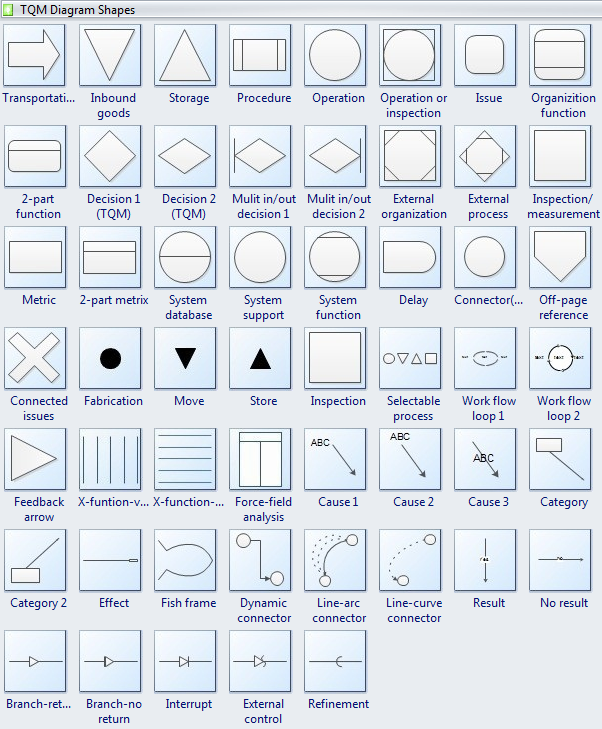 Here shows a screenshot of TQM symbol library in Edraw. The symbols strictly follow the international standard, and customizable. Here shows a TQM diagram example created by Edraw. Anyone could make a TQM like this without drawing skills required.